In 1845, more than a century before Rosa Parks refused to give up her seat on a bus in Alabama, Elizabeth Jennings Graham, a 24-year-old school teacher, boarded a streetcar in New York City. She forgot to check whether African Americans were allowed to ride it. When she was asked to dismount, she refused because she was running late for church. She clung to a window frame before a police officer threw her off. Graham filed and won a lawsuit against the Third Ave Railroad, receiving $250 dollars in damages. Her actions led to the eventual desegregation of railroads in the city. Graham has been identified as one of the “Rebel Women” of Victorian-age New York City” — a new exhibit at the Museum of the City of New York. The exhibit is small, concise and well designed, the walls painted a unique dark green that showcases 19th-century portraits and prints. ‘Rebel,’ is often associated with our pop culture references to it: a leather jacket-clad, cigarette-smoking James Dean in Rebel without a Cause, David Bowie’s memorable line, “Rebel, rebel, you’ve torn your dress,” or Bikini Kills’ early ’90s punk hit, “Rebel Girl.” It is hardly the character-type we associate with the Victorian women of the New York bourgeois scene. From this exhibit, we learn that rebellion comes from even the smallest transgressions of social norms — no need for fishnet stockings or leather of any kind. While many of the things the featured women did would not be considered “rocking the boat” today, women in that era could be considered rebellious simply by speaking out in the public sphere. 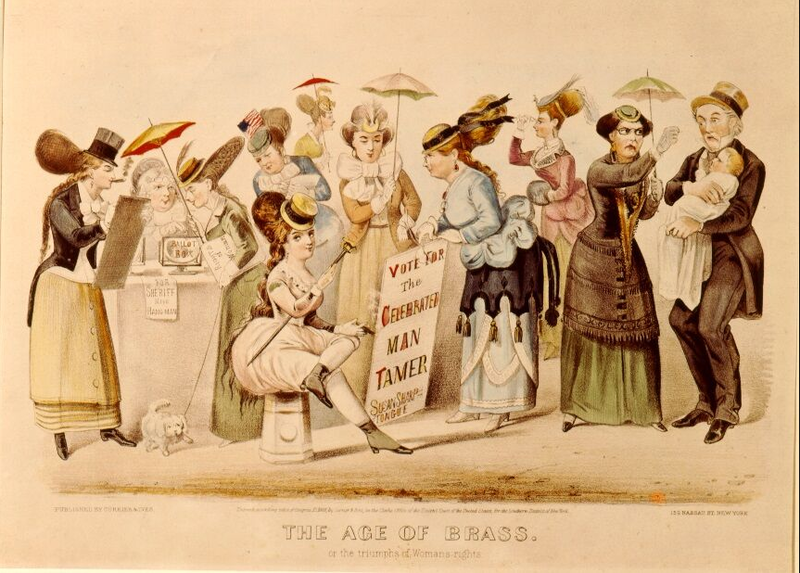 In the first half of the 19th Century, due to Queen Victoria’s strict moral code, “true womanhood” was marked by four core components: domesticity, religious piety, sexual purity and submissiveness. The exhibit begins with an examination of this “true womanhood,” a concept many women still struggle with today. Many of the fashion expectations, for example, seem shocking. There is a display of a rib-crushing corset, gloves that needed “stretchers” to put on, dresses so heavy that the wearer would have to lean far forward in order to keep balance, (then known as the “Grecian Bend”). In an opposing example, there are a pair of bright red, button-up shoes displayed. 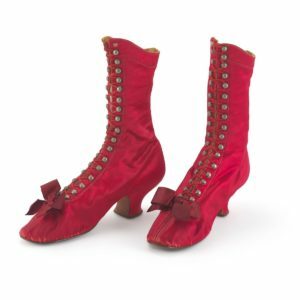 To wear these during the day would have been a sign of rebel status, as women were meant to be demure and not attract physical attention. While at first, the fashion sense of “true womanhood” seems outrageous to the modern person, we still consistently grapple with women’s clothing choices. Whether we are ‘allowed’ to vie for physical attention or if doing so means we are “sluts”; whether wearing “fashionable” clothing means we’re adhering to a certain type of patriarchy or if it means we can find a certain kind of personal empowerment in it; whether certain ‘non-feminine’ clothing shows our rebelliousness against mainstream notions of femininity or if our choices in clothing ultimately mean very little. The most fascinating aspect of this exhibit is the way in which it makes the viewer feel far away from what we perceive as crazy, antiquated misogyny and then quietly shows parallels to modern-day gender issues. In two long lines down what feels like a hallway, the exhibit goes through various “rebel women,” their names scrawled in over-the-top Victorian fonts. The women contend with birth control issues, being in control of their own bodies and being taken seriously in the workplace and in politics. Some of the women chosen to represent the rebels are commonly read about in history textbooks: social reformer heavy-weights like Elizabeth Cady Stanton and Susan B. Anthony are included — their attitudes towards women’s suffrage are considered some of the most rebellious of their time. Of course, we also find Nellie Bly among the rebels, looking cool and calm while doing her investigative reporting for New York World. But the exhibit also crucially includes lesser-known, nonwhite, lower-class rebels who are often forgotten but were no less important to the 19th century female-rebel movement. The news media openly reinforced a standard of exclusion of “unfeminine” women who were too opinionated or who defied Victorian values. Many of these women were villainized in sexist prints in newspapers (a means of public shaming), featured throughout the exhibition. Madame Restell, after making an income from her abortion services, was described as “The Wickedest Woman in New York,” depicted as having a satanic bat in place of hands. The bat is eating an aborted fetus. 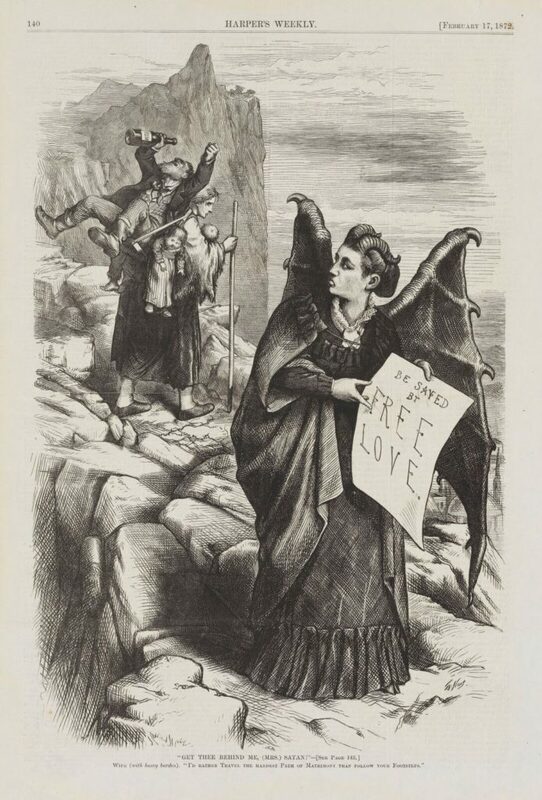 Victoria Woodhull, a “Free Love” advocate who believed women had the right to marry — and divorce —whoever they chose was depicted as a devil by Harper’s Weekly. There an uneasy feeling permeates throughout the exhibit, a subtle nagging that overarching, repressive social norms are still essentially the same for women two centuries later. But it also offers hope. We often view Victorian women as demure and rule-following, yet this exhibit shows how cracks in social fault lines can spread in even the most oppressive of societies.